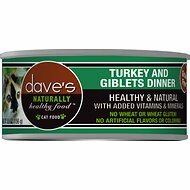 Give your kitty the nutrition he needs to thrive with Dave's Pet Food Naturally Healthy Grain-Free Poultry Platter Dinner Canned Cat Food. The formula provides plenty of protein to fuel all those adventures, with protein-rich turkey and chicken as the top ingredients. Every juicy bite is loaded with wholesome omegas for a lustrous coat, plus vitamins, minerals and essential taurine to help your pal look and feel his best. With no grains, wheat or anything artificial, even kitties with sensitivities can dive into their bowl. 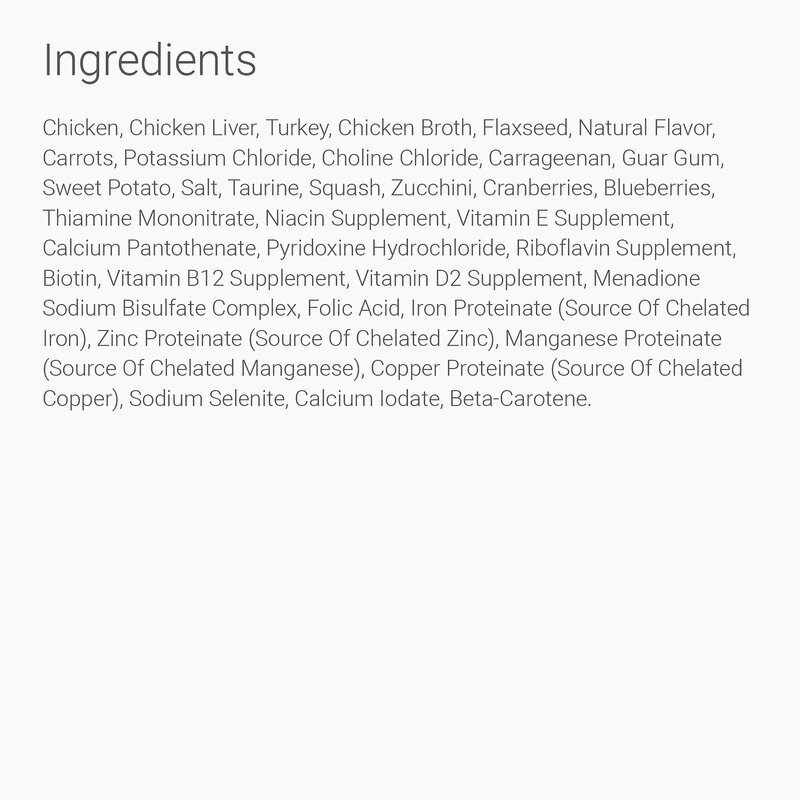 Chicken, Chicken Liver, Turkey, Chicken Broth, Flaxseed, Natural Flavor, Carrots, Potassium Chloride, Choline Chloride, Carrageenan, Guar Gum, Sweet Potato, Salt, Taurine, Squash, Zucchini, Cranberries, Blueberries, Thiamine Mononitrate, Niacin Supplement, Vitamin E Supplement, Calcium Pantothenate, Pyridoxine Hydrochloride, Riboflavin Supplement, Biotin, Vitamin B12 Supplement, Vitamin D2 Supplement, Menadione Sodium Bisulfate Complex, Folic Acid, Iron Proteinate (Source of Chelated Iron), Zinc Proteinate (Source of Chelated Zinc), Manganese Proteinate (Source of Chelated Manganese), Copper Proteinate (Source of Chelated Copper), Sodium Selenite, Calcium Iodate, Beta-Carotene. Feed 1 5.5 oz container per 5 lbs of body weight per day. 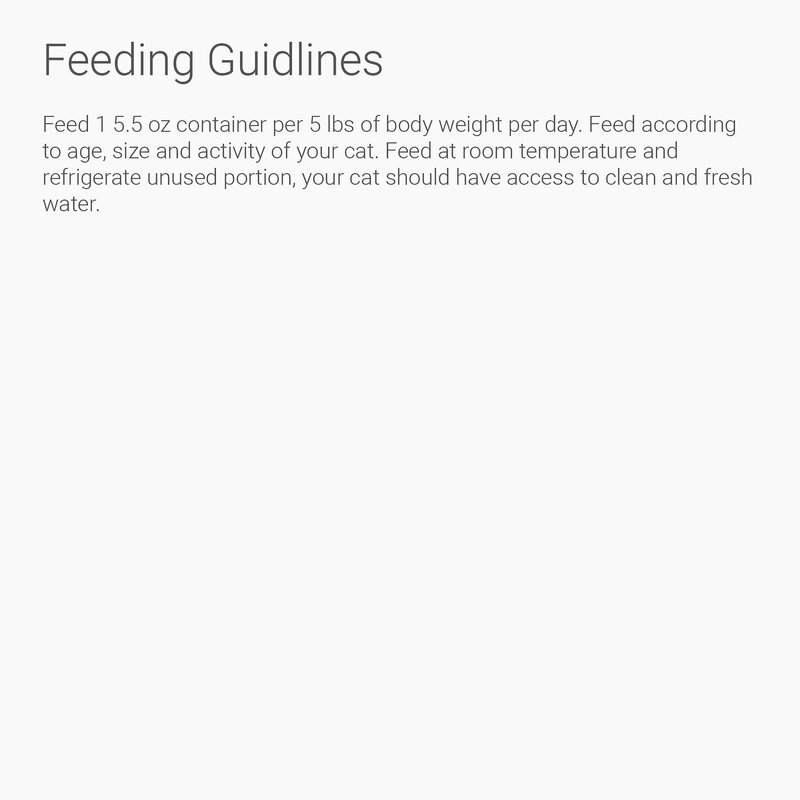 Feed a according to age, size and activity of your cat Feed at room temperature and refrigerate unused portion, your cat should have access to clean and fresh water. Good ingredients but they won't eat it. I called customer service for assistance in choosing a wet food for my cats. After about 10minutes we decided on Dave's pet food because I really liked the ingredients and my cats only like poultry, lamb, or beef food no fish. 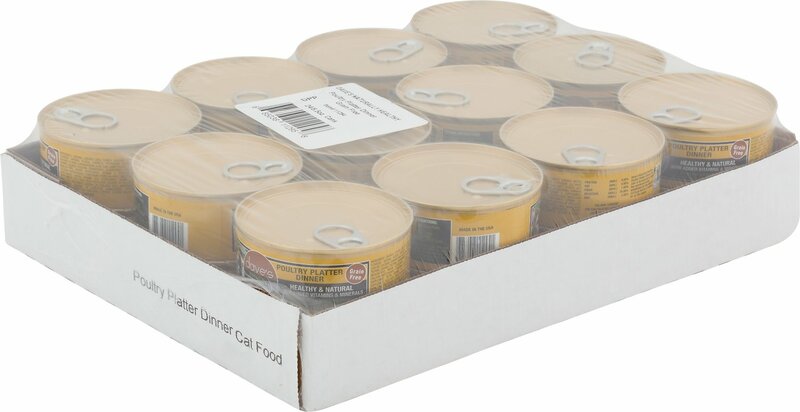 I was so excited once we received the order I opened a few cans and served each cat their individual serving but sadly they gave it a sniff and walked away not eating it. I guess we will have to try another brand. I have 14 indoor kitties, so there are expected preferences in the foods I serve. I have 5-6 different foods on hand and recently changed from some of the less favored. DAVE'S Poultry Platter was a hit with all of them. Dave's foods are always very moist, even wet. All my cats eat this - even my picky eater girl. It's a pate and goes a long way. I have 4 cats now and have tried numerous cat foods over the years. I keep going back to Dave's as this is one they all seem to like. Since I lost one cat several years back due to a recall on a very expensive brand, I rotate 2 different brands at all times. I have used and will continue to use Dave's in my rotation. finally I found a wet cat food that is of high quality and all 4 of my rescues love it. They actually like all of Dave's wet food except the ones with tuna which is made in Thialand. 3 cats wouldn't touch it with a 10 ft pole! Total waste of $ ugh. Can't even give it away. I'm sure other cats love it, not mine! My older cat loves this stuff! I will definitely be buying more. My order arrived quickly, and it is very convenient to buy by the case. 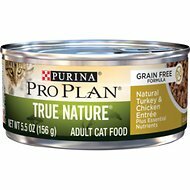 I've been feeding this product for about two months and it's a favorite pate canned food for our three kitties. Never any waste and it's easy to feed. THIS FOOD IS a Pâté. Neither one of my cats like this food. Even my super non-picky cat who eats almost anything does not like this pâté food. I'm aggravated with this brand for poor labeling. There's another version of Dave's canned cat food sold here & it actually says: Pate on the label, so one would automatically assume if the others don't say pâté then it's not a pâté.... This is very misleading on this brand's part. 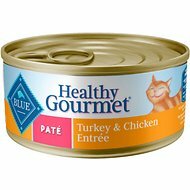 FYI: the Tuna & Chicken flavor (purple label) is shredded and my cats love it, there's nothing on the label about it being shredded though. Dave's is a U.S. made grain free pet food that is designed to keep my little ones healthy. Cats and dogs do not process grains well and can result in disease to their digestive systems. So I appreciate Dave!